We are almost done with the horrible foggy pictures. I promise. But a bad picture is better than no picture....agree? A little while back I posted some snaps from a race stanced green Miata (Roadster). 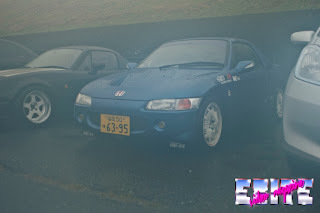 Right next to it was this nice Honda Beat, sitting nicely on some Mugen CF48s. The Beat is a great little K-Car that was released between 1991 and 1996. This was the last car that was directly approved by Shoichiro Honda before he died in 1991. It's a midship design, so think of it as a baby NSX. You can see these cars all over the place in Japan. Most of the time I see older men in them, suggesting that they are probably the original owners, and loved the car too much to let it go. More about the beat can be found on Wikipedia.